WASHINGTON—A federal judge on Friday sent President Donald Trump’s former campaign chairman, Paul Manafort, to jail pending trial, after Special Counsel Robert Mueller charged him last week with witness tampering. It was the latest episode in the fall of Manafort, a longtime political operator and businessman who Mueller charged with crimes unrelated to the 2016 presidential election. Some of the charges against Manafort date back to over a decade ago and relate to work he did in Ukraine. U.S. District Judge Amy Berman Jackson in Washington revoked Manafort’s bail, sending him to jail. Manafort has been indicted by Mueller in both Washington and Virginia on a raft of charges, including conspiracy against the United States. His trial in the Washington case is scheduled for September. He had remained on home confinement in Alexandria, Virginia, and had been required to wear an electronic monitoring device. Manafort’s trial on the related charges in Virginia is set for July 25. He has pleaded not guilty to all charges. Mueller was tasked to investigate allegations of collusion between the Trump campaign and Russia. The special counsel has not produced any charges or evidence related to collusion after investigating for more than a year. Trump has called Mueller’s investigation a witch hunt and has denied wrongdoing. A June 8 indictment charged Manafort and Konstantin Kilimnik, a Manafort aide and political operative, with tampering with witnesses about their past lobbying for Ukraine’s government. The indictment accused Manafort and Kilimnik of attempting to call, text, and send encrypted messages in February to two people from a political discussion group—the so-called Hapsburg Group—that Manafort worked with to promote Ukraine’s interests in a bid to sway their testimony. 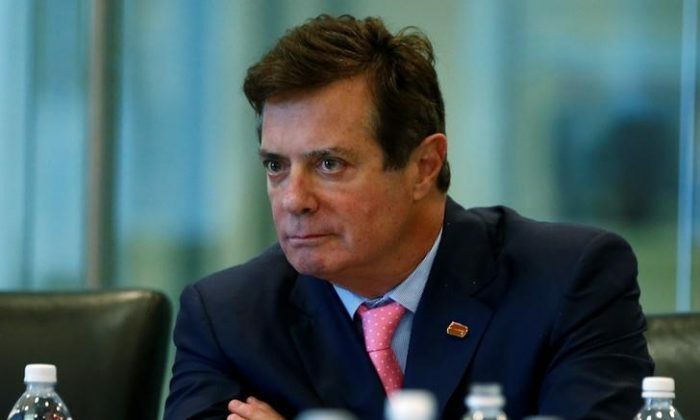 The charges against Manafort in Washington include conspiracy to launder money, conspiracy to defraud the United States, and failing to register as a foreign agent for the Ukrainian government under former President Viktor Yanukovych. None of the charges against Manafort make reference to alleged Russian interference in the election or the accusations of collusion between Moscow and Trump’s campaign. The Kremlin has denied meddling in the election.